Set in a sweltering hot summer in New York's Washington Heights, the experience of In the Heights started before we had even made it into the auditorium. The theatre usually takes its audience back a few decades to the time of The Railway Children, but for In the Heights the space had been transformed to an iconic New York setting, with references of avenues, subway stations and the smell of all-American buttered popcorn scenting the air. As we took our seats in the main performing space, that too had undergone a make-over, no longer encompassing a long train track but instead pulling us into the excitement and heat of a New York summer. There are a lot of colourful characters that make up the cast of this story but at the core are corner shop owner Usnavi (Sam Mackay), who is quietly in love with Vanessa (Jade Ewan) from the hairdresser's across the street; Vanessa's feisty boss Daniela (Victoria Hamilton-Barritt); the golden child of the neighbourhood, Nina (Lily Frazer), who dropped out of Stanford months before but is too afraid to tell her parents; and the glue who holds everyone together, Abuela (Eve Polycarpou). Each of these people have known each other for years and their stories are as interlinked as they are diverse. However, the strength in this musical does not lay with the story and likeable characters, but with the spectacle that transforms the space into one filled with a contagious song and dance atmosphere that has even the most reluctant of participants (such as myself) eager to get up and join in on the fun. From the moment the lights went down, the performances on stage were nothing short of sensational. 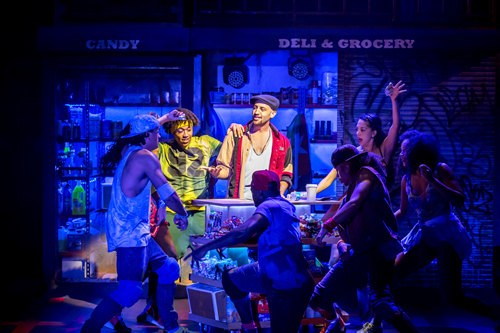 Despite all the praise the show has received during its first London outing in 2014, my expectations still did not live up to the incredible experience of actually watching In the Heights live on stage – there is little that can prepare you for just how energetic and vibrant it truly is. The choreography by Drew Mconie sizzles with excitement, and the entire cast does a phenomenal job creating a party atmosphere – even in the more subdued parts of the book by Quiara Alegria Hudes. When thinking about New York it's easy to get caught up in the overwhelming negatives, from 9/11 and a city bursting at the seams with people, to an unwelcoming atmosphere and a high crime rate, but In the Heights shows only the best side of the Big Apple and what a fantastic side it is. Musically it was less hip hop than I expected, more Latin American soulful tunes mashed together with musical theatre greats such as Rent and West Side Story. It may sound like a bit of a random combination but trust me it works. In an incredible way. There wasn't a weak piece of music in sight in Lin-Manuel Miranda's fantastic songlist, but particular highlights to me were Breathe, Pacienca y Fe and Blackout, mostly due to the spine-tingling performances from Lily Frazer and Eve Polycarpou respectively, and the high energy of the act 1 closer bringing the entire cast together in one glorious sequence of sound and movement. In the Heights is an exhiliratingly energetic show; it pops, it locks and it even made me shed a tear or two. It may have already extended its initial 8-week run into 2016, but there will undoubtedly be another rush on tickets soon – so you better get in there while you can as Washington Heights is the place to be for the foreseeable future and you don't want to miss the must-see show of the season. In the Heights is running at King's Cross Theatre and is currently taking bookings until 3 January 2016. You can book tickets here.